We also had the obligatory 'receiving gifts for being good' but compared to the list they came up with, we'll let that one in too! 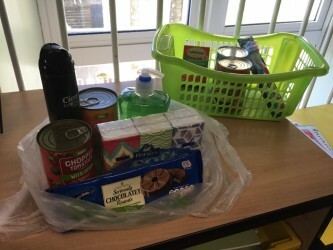 This led us nicely on to the introduction of our 'Alternative Advent Calendar' whereby each day a child is selected to choose an item from our shopping bag and place it in our green basket for people who are less fortunate than themselves. By the 21st December we will have 21 items in the green tub, which will be given to a local charity to help improve someone else's Christmas. As Christmas is about giving and receiving, each child will also receive an edible tree decoration that they will bring home and hang on your Christmas tree.